I love these mittens. I love the texture of the fabric, I love the way the 2-colour cable looks like embroidery, I love the whole sort of Renaissance textile feel of the things. There was just one problem: they only came in small. The contest was for Malabrigo, and at the time, the only appropriate yarn in their offerings was Sock, so the only size I could offer the pattern in was for a 7.3″/18.5cm hand circumference: too small for a lot of people, including me. I suppose I could have done a second size in another yarn after the contest, but the Malabrigo colours are part of what makes the design, and I kind of wanted to stick with their yarn. 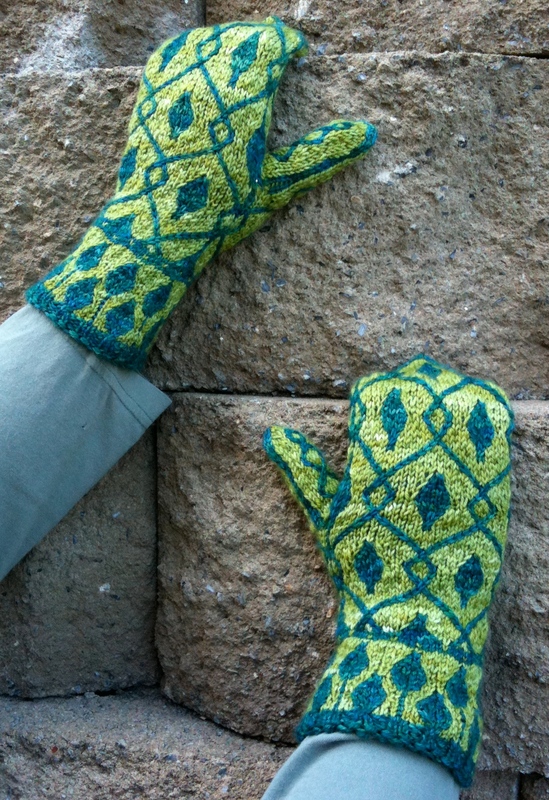 Large mittens in Arroyo Natural and Aguas. Photo by Wallace Lewis. At last, I can make a pair for myself. The Let It Be Spring pattern can be purchased through Ravelry, Craftsy, or Patternfish. Needles: Small: (2) US2/2.75mm circular needles (Large: (2) US3/3.25mm), 24”/60cm or longer or size to get gauge. Since some of the stitches cross over the middle of each side, I found it easier to make these mittens with 2 circular needles. (Magic Loop would work, too.) 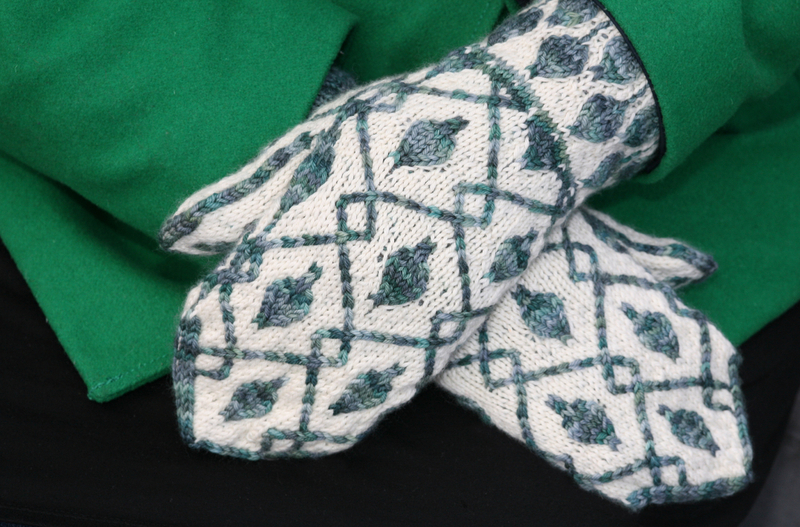 The traveling stitches in the mitten body draw that part in a bit, so you may want to use slightly smaller needles for the cuff. Samples shown were knit with the same size needles throughout. Oh, these are gorgeous! 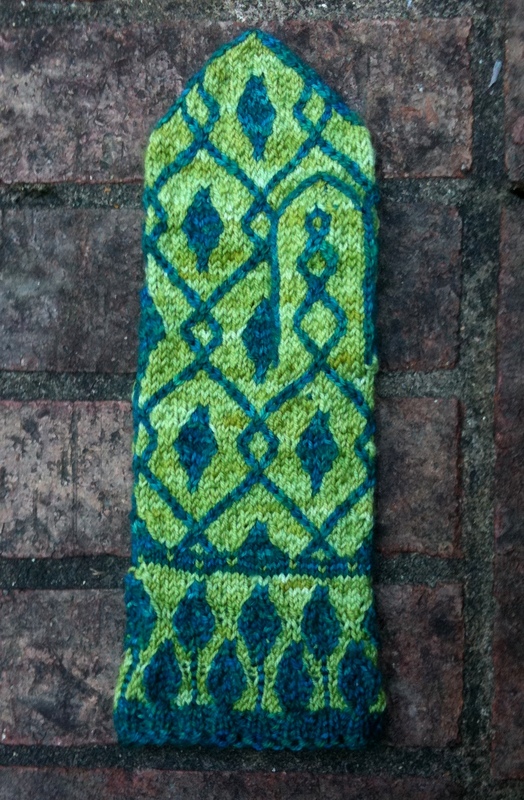 I love the lime and teal together, the pattern is perfect, and I don’t knit.